Whew! The holiday decorations are all down and put away, and for a minute I was wondering if I had mistakenly packed up my mojo in one of those boxes! Thankfully I've found it, as I've got a bunch of projects I need to get to. The Grunge Rose Technique has been floating around the web for sometime, I'm not sure who the first creator was , if you know, leave me a note in the comments so I can give them credit. Recently Tim Holtz showed them on this years 12 Days of Christmas Tags Day 12, and I did a quick google search and found an awesome tutorial here on Maria's Blog using card stock. While the flower I used is not the same as either of theirs it worked just fine. After cutting the flowers from Grunge Paper, I used the Antiqued Glimmers Technique from the current TJNL to add color to the paper. I used a combination of Concord Distress Ink and Lavender Fields Glimmer Mist. Since I am not a patient stamper, I used my Heat Tool to dry the coated Grunge Paper pieces. I used Glossy Accents to adhere my petals, once dry, and added the leaves using the Sizzlits Little Leaves die, then some Distress Rock Candy Stickles to the Rose and left it to dry. 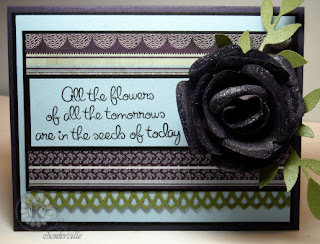 The sentiment is from Kitchen Sink Stamps 3 Step Hibiscus, I thought it worked great here! Speaking of Kitchen Sink Stamps, have you seen this thread on Splitcoast? If your a fan of Kitchen Sink Stamps, or have ever been curious about them, be sure to check it out, there's been some chatter about Kitchen Sink Stamps Workshops, I attended the one in Georgia this past September and it was a blast! 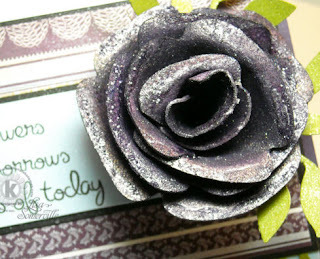 After the Rose was dry and my card panels assembled, I adhered the Rose to my card with Glossy Accents. I'm thinking about taking it off and adding some type of pin mechanism, so my recipient can wear it. What do you think? Hi Lisa! What a great card! The rose is really beautiful. I have seen roses similar to this that had a pin for wearing. The only difference was that the rose was cut from craft felt. I think it would be a lot of fun to be able to wear the rose or even pin it to your purse. I luv it! It looks so real, I can almost touch it. The saying is perfect, and making it usable, is a great idea. Very pretty! Love the rose--will have to check out the tutorial. Stunning. Just got some grunge paper. I need to give it a go. I haven't checked out the cardstock tutorial, but I made one of these when Tim was doing his Christmas tags. Amazed myself...since I am NOT a folder or assembler! ;-) This is a beautiful card to begin with, and the rose is a special touch. Beautiful card Lisa! I loved that Tim rose. delightfully beautiful. I do have a question? Is this a card that you hand deliver or can you share how you would mail this wonderful card. I've had a few people ask about mailing this card - it's one I think I'd leave for hand delivering! Your card is beautiful, that rose is so special it should be on pin, so many things you can pin it to. It must really be stunning in real life. Excellent! This is stunning! What a beautiful rose! The card is gorgeous, and making the rose into a pin is a wonderful idea. Anyone would love to have such a beautiful card. Thanks for sharing.